2 in 1 + craving alert! 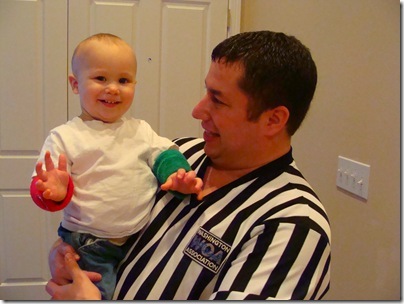 My husband is a Washington State Wrestling Referee, primarily for high school, and is also the chairman of a scholarship fund AND a tournament director. He is one busy guy in the winter! I packed him a AB and J sammy and I actually forgot to pack anything for me. We left at about 11AM and I quickly dashed home for some much needed protein! 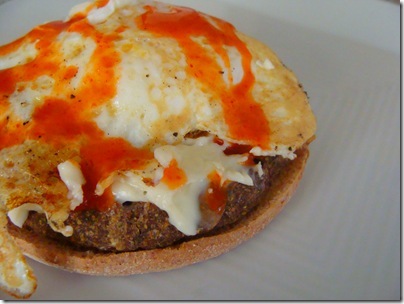 Spelt burger, fried egg and hot sauce. Oh. Yes. I. Did! 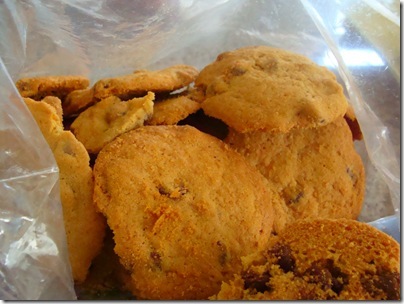 So I fixed temporarily calmed it by having home made chocolate cookies. Um, I ate 3. Just like that. I don’t feel so bad when they were made by me, though. On the way home I stopped for…. a small Dr. Pepper. It sounded soooo good and I haven’t had soda in so long! Whatever. I think I am about to start my period because of my strange cravings. Ok, I have a question. Am I the only one who doesn’t keep track of the days between? I am not on birth control and I never write down the last day or the start day. Marc finds this very strange that I have virtually no clue about my “time of the month”. In other news: I am OFFICIALLY a runner! Every time I run I keep bruising my toenail. I could see it through the nail itself and I knew that one day it would fall off. Literally every day I would play with it – like a kid playing with a loose tooth! Peeling it back, examining it, waiting, waiting, waiting. The strange thing is that it looks like it’s painted red but it the massive bruise that was under my nail. Now all I have to do is repaint my nails (see the specks of red?) and you wont be able to tell! J and I shared an apple with PB for an afternoon snack. I fixed J a grilled cheese sandwich for dinner and it smelled sooooo good! So after he went to bed I fixed myself one, too! 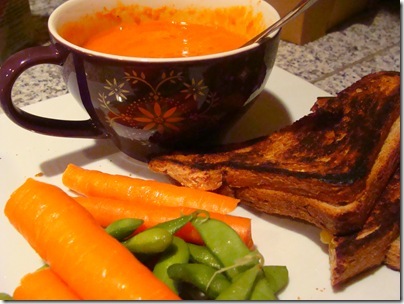 Roasted pepper tomato soup, raw carrots and edamame. 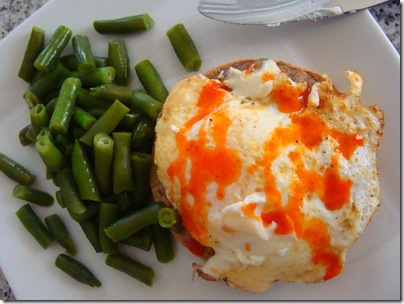 I even sprinkled basil flakes on the cheese – I love basil! And I love this soup! 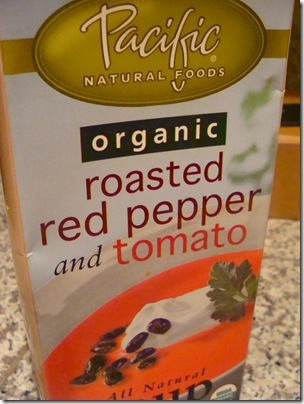 I ALWAYS have this kind in the pantry! Marc was home at about 11, he was exhausted! Today we slept in until about 7. J actually woke up a tad earlier than normal, and because of this he was in a not-so-great-mood. I made J and Marc pancakes and myself Green Eggs and toast. 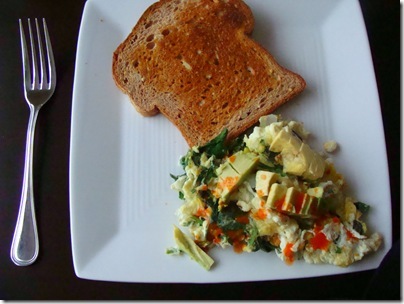 I love adding spinach to my egg scrambles. I also added some cilantro, white onion, topped with avocado and hot sauce. 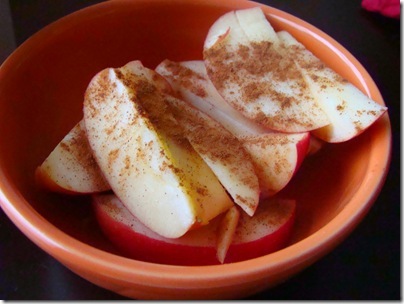 And a bowl of cinnamon apples. 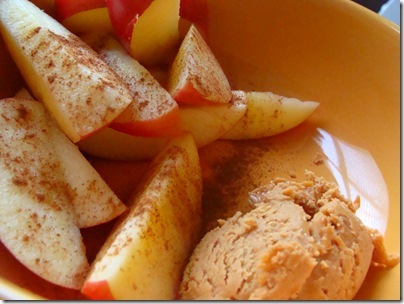 This is best idea yet – apples and cinnamon. Simple and oh so good! Lunch was Thai, Marc’s request. Funny because I have been wanting Thai for the past few days! 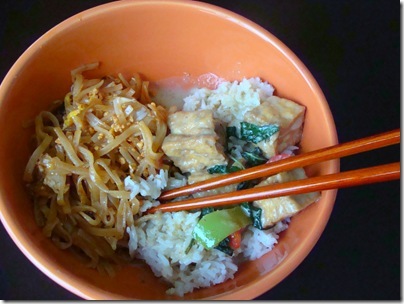 Pad Thai and green curry with tofu. YUM! I was so stuffed after this that I decided to walk it off with J at the grocery market. I love shopping with my little guy – I talk to him, showing him all of the different kinds of food. He loves to be out with other people and looks at everyone and everything. I ate a Z bar at 7, went to the gym for a 6 mile run and ate yet another bowl of yogurt, strawberries and trail mix. That pretty much sums up my weekend! Now I am going to take the last few minutes to catch up on all of YOUR weekend recaps! This entry was posted in breakfast, dinner, life, lunch. Bookmark the permalink. 18 Responses to 2 in 1 + craving alert! Ew on the toenail…somehow I've never lost one. I buy my running shoes a half size up from my regular shoes.I also don't keep track; sometimes I'll think back and remember that I got it on the day that I had a test, or that a paper was due. I've never EVER been regular anyway, so it makes no sense to me to track. The food looks awesome, I love the green eggs and the fried egg on the burger. It sound's great! I never keep track of my periods, my daughter just got hers about 6 months ago and I never keep track of hers either though she seems fairly regular. You'd think it would be a simple thing to track, yet I don't at all. I don't even know the date any day of the month half the time. I have mutant pinky toenails that are thick and gross and if they get too long, I end up bashing them and they fall off. It doesn't even hurt. So disgusting. Toes in general just aren't pretty. Owww! Your toe gives me the eebee jeebies!!! Runners do have nasty toes and nails, that is a fact! OHmigosh, my toe hurts for you!!! I don't have a period (I have the Mirena IUD) but I used to track it.Cute pic of J and Marc! And the pad thai looks fabulous. Toe = sick. I only keep track of my period with my birth control. BAH! Your toenail!!! That's quite the close-up.Sure you're not preggers?!?!! ?Now that I've freaked you out, I track my period on my iPhone. There's an app for it and I love it-it helps keep me sane. ew on the toenail! haha, but i secretly kept going back to look at it!i really need to make some spelt burgers soon! MMMMMmmm! Your Pad Thai looks awesome! Did you make it yourself or get take-out? Your toe nail was nasty, haha! Believe it or not, I have never lost a toe nail to running. I don't know if it is just that I know that my feet swell when I run, and my running shoes are loose enough to accommodate that swelling or what. My hubby plays soccer, and the first time I went over to his house he had nail polish in his bathroom. I was like, "Who's are these?". They were his! He would paint his toe nails green and blue when they would start to look nasty!